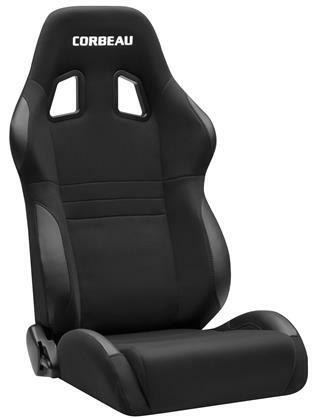 The dynamic Corbeau A4 Racing Seat is the perfect application for tight spaces and minimal headroom applications. Standard features include: high-density injection molded foam, ergonomic design, harness belt capability, integrated shoulder, kidney and thigh support, leatherette high wear patches, and a fully adjustable seat back with a flip forward fingertip controlled lever for rear access. The A4 is extra aggressive in the kidney area and will fit up to a 36” waist. The Wide version (BLACK ONLY) will fit up to 40” waist.